Every now and then a scientific discovery comes along which has the potential to significantly change fundamental paradigms. Graphene is a case in point - known about for years but only recently starting to be seen in practical applications. Of these, one of the most interesting is the potential for low weight highly efficient batteries. Battery size, weight and efficiency are major limiting factors in the design of portable electronics, and it will be particularly important as wearable technology becomes more prevalent for those issues to be addressed. Batteries based around a modified graphene structure may well be part of that solution. 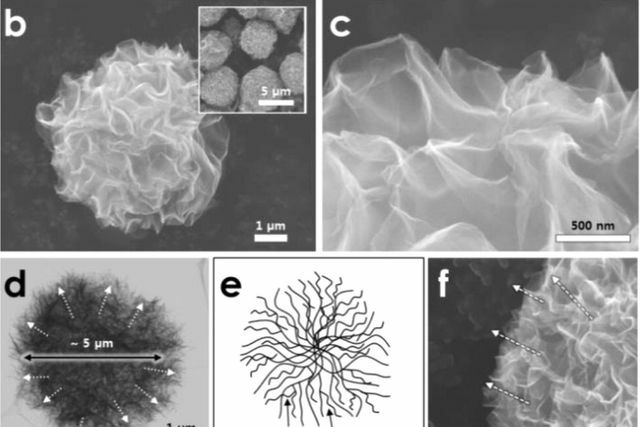 Even without that potential for a significant breakthrough, though, I would have found it very hard to resist an article which starts with the words "Deep-fried pom-poms of graphene..."
Deep-fried pom-poms of graphene could make batteries smaller and more efficient. The super-material, which is just one atom thick, has been turned into three-dimensional structures by spraying graphene oxide droplets into a hot solvent. The new technique provides a simple means of using graphene to make electrode materials for batteries. Graphene is the most conductive material known to man, but its physical properties require it to be altered for use in batteries. As graphene is very thin and flat its surface area is limited -- this is key as the surface area of an electrode has a huge impact on battery power.